It was nine in the evening when we arrived at Byron Bay Hotel & Apartments. The reception area was already closed at that time (which is not uncommon in boutique hotels in Australia) but they made sure that we got their email on the procedure to check in. It was Amazing Raceish kinda thing as we tried to get clues on how to enter the building and check in to our room. All those time, the staff made sure that they remained with us through text messages. A nice gesture from them. It was after our simple wedding in Zambales last February when we did a honeymoon trip afterwards. We originally planned on having a winter trip to Japan but after a sponsored deal on a Manila to Sydney flight via Scoot, we totally altered it. After consulting with One Vine Migration, we got a one-year multiple-entry visa which prompted our Australian escapade (you may check my guide here on How to Apply for Australian Tourist Visa in the Philippines). We then plotted our route to some of the key destinations in the country—Sydney, Byron Bay, Gold Coast and Brisbane. After which, we scored some great deals on tours, activities and transportation in Australia via Klook App. Our Manila to Sydney Scoot flight had a 16-hour layover in Singapore and we used this time to enjoy our favorite Malay dishes on some of the hawker food centers in downtown. After which, we had our eight-hour Singapore to Sydney flight which was lovely as we got to travel on a Boeing 787 Dreamliner for a low-cost carrier fare. Sydney was the first leg of our trip. We had five days in the city and did a Sydney DIY walking tours as well as a nice cruise along Sydney Harbour. We also had a day trip on the UNESCO World Heritage Site of Blue Mountains. Our next stop was Byron Bay. We flew from Sydney to Gold Coast and then made a quick stop to Currumbin Wildlife Sanctuary for our first encounter with Aussie Wildlife (read:kangaroos and koalas). Hotels in Sydney are quite pricey but we found a cheap accommodation in Sydney CBD. On this second part of our trip, two of our best buddies crashed our honeymoon and arranged everything, sort of a wedding gift for me and my buddy. 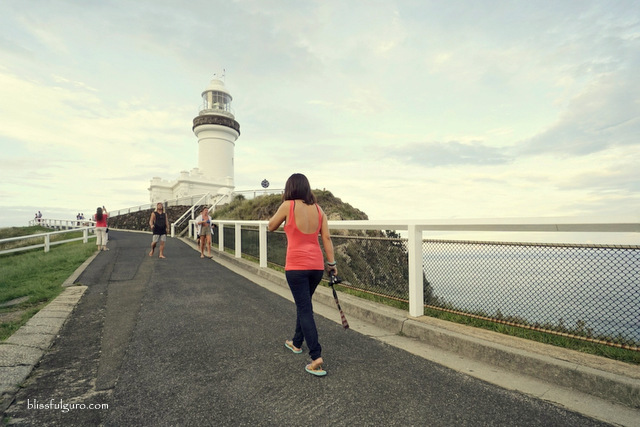 We arrived at Byron Bay before sundown and headed straight to Cape Byron Lighthouse, taking advantage of the fair weather that afternoon. Byron Bay Hotel & Apartments is located in the heart of the town. They offer nine types of rooms—from King Room to a Three-Bedroom Apartment—which is ideal for either business or leisure travelers. Another good thing about it is that they have a wheelchair-accessible apartment with considerations to people with limited mobility. Arriving at nine in the evening, we were provided with a message through email on how to get in. Apparently, some of the hotels in Australia are not manned during the night. In this case, their reception hours are from 8:00 am to 6:00 pm. We somehow got through the almost Amazing Raceish checking in process and settled on our respective rooms right away. Neutral colors greeted us as we opened our spacious King Room (check for discounted room rates). Earth tones from the sheer drapes, furniture and fixtures added life to the plain white walls. It was sleek and clean. No frills, just the basics. The wardrobe closet housed the ironing facilities, in-room safe, extra pillows and blanket, tea and coffee-making amenities, and mini-bar. The en suite toilet and bath echoed the neutral themes of the room with an added touch from the carved wooden frame of the mirror. There’s a bathtub, a separate stall for shower, lavatory and toilet. Bathroom amenities were also provided. A private balcony with a view of the quiet neighborhood offered a space where we could have some fresh air. I collapsed on our huge bed and was ready to snooze right away, but a message from our friends that we’ll check out a nearby local bar made me jump out of the bed—because booze is always a good idea. Byron Bay is a small hippie coastal town in the border of New South Wales and Queensland. A popular holiday destination for Australians, it’s known for its beaches, surfing spots and retreat houses. The laid back vibe of the town attracts some folks who want to have a boho lifestyle. We lounged at The Railway Friendly Bar and tried the cider drinks which I totally love. 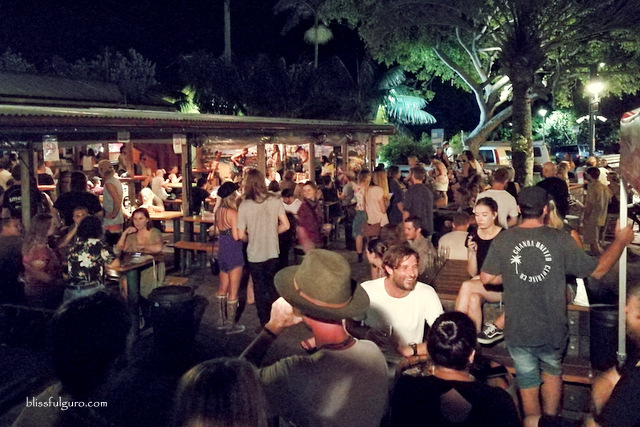 It was an amazing night as we got to experience the relaxed vibe of Byron Bay on a local bar. We woke up later than expected the next day. We asked for an extension of the supposed 10:00 am check-out and got an extra hour to relax some more. It was only then that we realized that we should’ve stayed longer at Byron Bay. Too bad we already booked our accommodation in Gold Coast, our next stop in Australia. It was only in the morning when we noticed that there’s an outdoor pool and as much as we wanted to take a dip, we need to bounce shortly, too bad. We had an amazing time in Byron Bay. It may be because we were there for a short period of time that we got to appreciate every moment we had or probably we fit effortlessly with the hippie community. All the same, Byron Bay Hotel & Apartments became our home base in Byron Bay and we will surely be back.